The ‘Pulse Pool’, named by the developers Sekisui House Australia, was officially opened in January 2013 and handed over to the residents of luxury residential complex ‘The Cornich’, at Wentworth Point in Sydney, NSW, as a gift. The Pulse Pool was designed in 2007 by Bob Collingridge, an aquatic engineer, structural engineer and architect from Collingridge and Associates, who also designed the pool’s hydraulics. However, it wasn’t until August 2012, 5 years later, that construction of the pool began. When the builders of the complex contacted Sunset Pools to commence work on the pool and its hydraulics, time was of the essence as the developer needed to complete the project within the specified time frame to avoid damages. Within 30 days, the pool was marked out, the site excavated, formwork constructed and the reinforced concrete shell poured. Ben Thompson, principal at Sunset Pools, managed the pool’s construction. “Time was essential as the developer was giving the pool to the community as a gift and many of the large buildings that surrounded the pool were coming into occupancy. Additionally, it was the beginning of summer,” he said. Initially, 600 m3 of soil was excavated then the site was backfilled with 60 m3 of crushed rock, all before forming the pool’s enormous shell. 3000 bars of reinforced steel and over 200 m3 of concrete were used to create the Pulse Pool design, forming the unusual L-shaped pool. 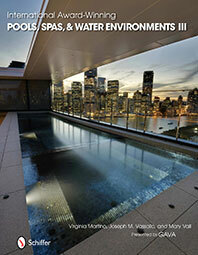 The shell structure, measuring 20 x 50 m, is over 30 times the size of an average backyard pool. To efficiently process the pool’s 1.4 million-litre capacity, Doug Fulham from Fulham Engineering Service custom designed and built six commercial-grade skimmer boxes. Each skimmer box is part of the pool structure with auto CAD custom-designed, 316 stainless steel skimmer baskets, weirs, lid structures and more. Driven by a 15 kW three-phase Southern Cross pump motor, three FM 1600 sand filters, each weighing two and a half tons, process 73.4 litres of filtered water per second, then return it to 48 individual pool returns distributed strategically throughout the shell. High-capacity automated filtration and sanitation, plus CO2 injection, maintains pH levels and completes the pool’s water management system. The beach area allows swimmers of all ages to easily enter and exit the pool as well as providing access for those with a disability. 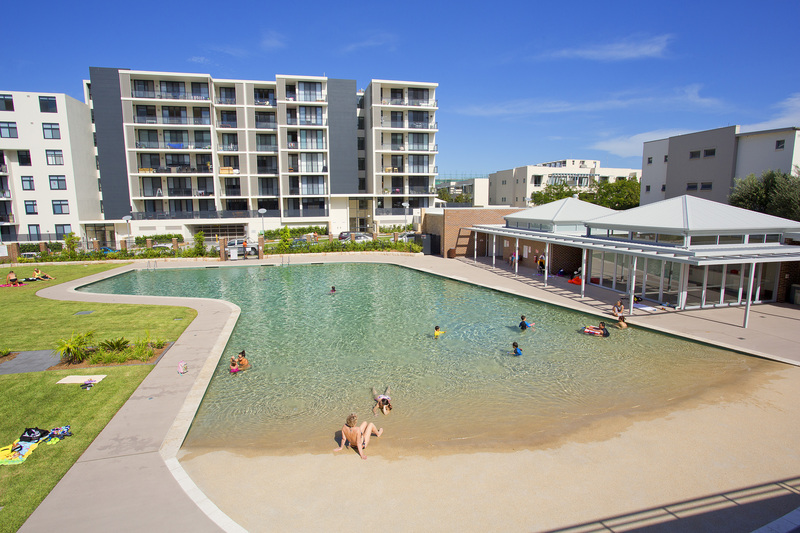 “The beach area is just a simple egress; however, in such a large-scale pool, the aquatic engineer called for a manifolded 21″ filter water line return system with a common line at 150 mm from the plant room. This was to aid the filtration in the shallow water,” said Thompson. When considering the pool’s interior and exterior surfaces, the developer was looking at costs and the overall look of the design. With this in mind, Tumbled Travertine 30 x 406 x 406 mm was selected as the coping, Ezarri glass mosaic tiles were selected for the waterline tiles and the interior was Golden River Pebblecrete. According to Thompson, the biggest issue of the entire project was finding a pebblecrete contractor who would take on the large job. “At first I didn’t think it would be a problem and I called my pebblecrete crew who handle large projects. They inspected the concrete shell and submitted a price. “At the beginning of December our pebblecrete crew, who had known about the job for six months, were ready to start. Over 20 pallets of Golden River Pebblecrete plus the cement was already on-site and ready for launch. “On the first day of two scheduled days, the pebble crew became frustrated with the job and walked off the site, leaving the materials. With just three weeks until Christmas, I called every pool company known in Sydney for help. “Thankfully, Pebble Masters came to the rescue. They aimed to apply the pool interior over two days. However, on the first day of application they tried to take on such a large surface area in one go that it was unsuccessful. There were numerous other challenges faced by the team when constructing the Pulse Pool, mostly due to the pool’s size. For example, the team also had to consider concrete hydration complications while curing occurred. “A standard hose or water irrigation system wasn’t going to cut it. Instead, we used an acrylic membrane sprayed the morning after concrete placement to entrap the moisture. This way we could continue with the other half of the pool spray and not worry about excess water issues. 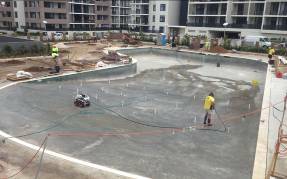 “Due to the size of the pool, both when excavating but most importantly with the concrete application, we couldn’t have the laser level positioned in one spot. Over large distances, due to the horizontal curve, as a general rule of thumb you lose approximately 1 mm in height over every 10 m in length if using a standard laser level. In our case, we were using the very best Hilti level; however, the fall was still taken into consideration at the time of concrete placement and hydraulic fit-out for the wall penetrations. If you’re using a GPS and computer surveyor level then all the calculations are done for you,” Thompson advises. Thompson believes that the success of this and other projects comes down to the aquatic engineering and use of appropriate commercial pool equipment. “In the commercial sector many projects will be highly specified, some with 100 to 150 pages of specifications accompanied with hydraulics schematics, technical data schedules and architectural drawings from licensed aquatic and structural engineers. On the other spectrum, large builders will call for qualified and experienced commercial pool builders to submit a price as ‘design and construct’ and all we receive are the architectural drawings. “The biggest problem with this is that pool builders will create their own specifications with their acquired knowledge and experience and in most cases not seek the expertise of an experienced and licensed aquatic engineer. Some companies just add additional residential equipment to assist with the water management. This doesn’t cut it and leaves the pool at a high risk of creating Cryptosporidium and Giardia – not to mention the poor person who contracts the terrible disease,” he said. Just 18 weeks after construction began, on 18 December 2012, the completed pool was handed over. The Swimming Pool and Spa Alliance awarded this pool with ‘Silver’ in the category of ‘Commercial Pools or Spas over $250k’.